Since the start of October the stock of Dewmar International BMC, Inc. (OTCMKTS:DEWM) has been sitting on the verge of the triple-zero price ranges unable to make a more pronounced move up the chart. That wasn’t the case during yesterday’s session when investors in a state of buying frenzy managed to shift close to 150 million shares. 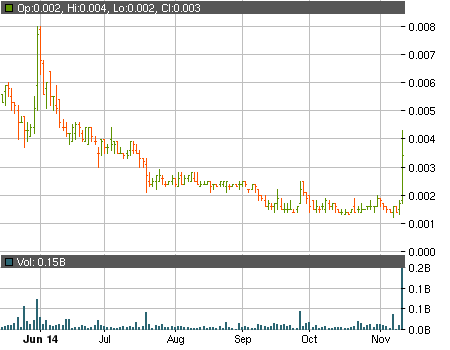 The overwhelming support pushed the stock to a close at $0.0034, representing a gain of exactly 100%. So what caused the sudden change in investors sentiment? Well, the CEO of the company decided to issue a rather lengthy message that finally revealed some information about DEWM’s current operations. The reaction from the market shouldn’t be so surprising if you take into consideration the fact that the previous PR came at the start of May and since then investors have been left in the dark. The situation gets even grimmer because in addition to the lack of press articles DEWM hasn’t filed a single financial report for the past twelve months. So can the current message from the CEO offset these massive red flags and help the stock form a more prolonged upwards trend? It is true that a couple of positive events have taken place. Apparently the company has managed through its toxic funding and at the moment has no new or outstanding toxic financing facilities. Unfortunately that doesn’t change the fact that between November 14 and September 30 nearly 1.4 billion shares have seen the light of day and now there are 2.4 billion outstanding shares. The authorized shares are 2.5 billion and that number may be increased if DEWM is forced to look for more external financing. The CEO also comments that for the past 52 weeks more than 20 billion company shares have been traded and this reflects the level of interest in Dewmar. Strangely he didn’t mention that since it hit its 52-week high of $0.033 back in February the stock has wiped nearly 90% of its value and that is after yesterday’s massive gain in share price. No explanation was given for the decision to stop filing financial report, either. A brief mention was made that the company was focused so much on tactical execution that it didn’t have time for its formal reporting. At least an accounting firm has been hired to audit DEWM’s financials and investors should expect the 2013 annual report to be completed by the end of this year. Until DEWM how its recent sales have been going and how much revenues it is generating the their stock should be regarded as an extremely risky choice for investment. It is paramount to do your own due diligence before committing to any trades. Where Will Nutech Energy Resources Inc. (OTCMKTS:NERG) Head Now?